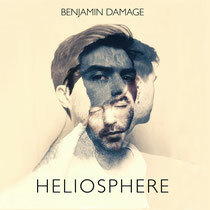 With Benjamin Damage already presenting his second album, ‘Heliosphere’ it is easy to forget that he has only been releasing records since 2010. Only two years after his first track was released, Benjamin presented his first album “They!Live”, produced with Doc Daneeka. The pair used some Modeselektor recording downtime and produced the album in a period of 6-8 weeks at the Monkeytown bosses studio in Berlin. The trip to Berlin had a definitive influence on the sound of the album that successfully merged UK and Berlin styles garnering critical acclaim. Now after two years of mainly collaborative work, the time has come for Benjamin to focus on some solo activities. Having made remixes for Sizzar, Data Romance and more, followed by the techno single ‘Swarm/Headache’ (50WEAPONS) Benjamin Damage is now set to unveil his debut solo album in early 2013. ‘Heliosphere’ is a sonic sci-fi techno album reminiscent not just of early Plaid, Black Dog Productions, Boards of Canada or Luke Slater´s 7th Plain project, but also dancefloor classics by the likes of Surgeon, Regis, Dave Clarke or Jeff Mills. The album brings to mind the flavour of 1994 without losing the sense that we’re into 2013 as of now. Ear-catching murkier numbers morph into merciless bangers whilst Damage also creates soundscapes ranging from melodic to dark, rough and sweet, all at once. It’s out February 22 on 50WEAPONS.